While it is true that Carpet Pythons are not Ball Pythons, they do still stress. Just look at what Yafe has been through since leaving his former home. He had just gotten "used to" the routine (yet stressful) daily treatments. So perhaps he felt just comfortable enough to finally take some food and eat it. But a day later there was yet another stressful event, the transport to the Vet, Vet examination, Trip back home. All while still digesting his meal. While the biggest part of the meal gets broken down within a day or two, digestion isn't done in that short amount of time. Its a lot on him. A lot of stress. I would treat him like a "newly arrived snake". Meaning, leaving him mostly alone to de-stress. Peek in on him, but keep even that to absolutely necessary minimum. Give him time to finish the digestion. Digestion is a big process for a snake. True, they gain energy from the nutrition, but they also use up quite some energy in the process. Everything in their body starts working hard. It is no big deal at all to wait a few days at this point. Offer on Sunday and if no go, wait another week. Perhaps you will have better luck once he trusts his new routine and starts feeling safer. Perhaps he needs to have a bowel movement, however small that may end up. His system has went through so much. Illness, stress, meds, treatments, more stress. He isn't emaciated, he isn't going to waste away. Us humans want to heal and nurture. For us that means rest and good food. A snake needs nutrition too, but their metabolism is quite different from ours. I firmly believe that during these few days he gains more from "low key/low stress" then another meal 4 days after he ate and with another vet visit since then. Just breathe and relax. Yafe looks good still. He knows what he can handle and who knows, maybe it is better this way. Would he take food before his body is ready for it, he may have started on a dangerous cycle of regurgitation, which is NOT what any of you need right now. He has already proven he is willing and able to eat. So he will, once he is willing and able, again. I know you just want this to be over and done with already and finally begin the journey with a healthy and eating snake. And you are almost there. Last edited by zina10; 11-29-2018 at 10:48 AM. Very wise words. Very wise indeed. Yafe peed, urated, and maybe had a speck of poop in there somewhere. There was quite a bit of urine, so it looks like he's staying hydrated, which is good. I literally took him out for 2 seconds, put him in his holding container, cleaned his tank, and put him back. 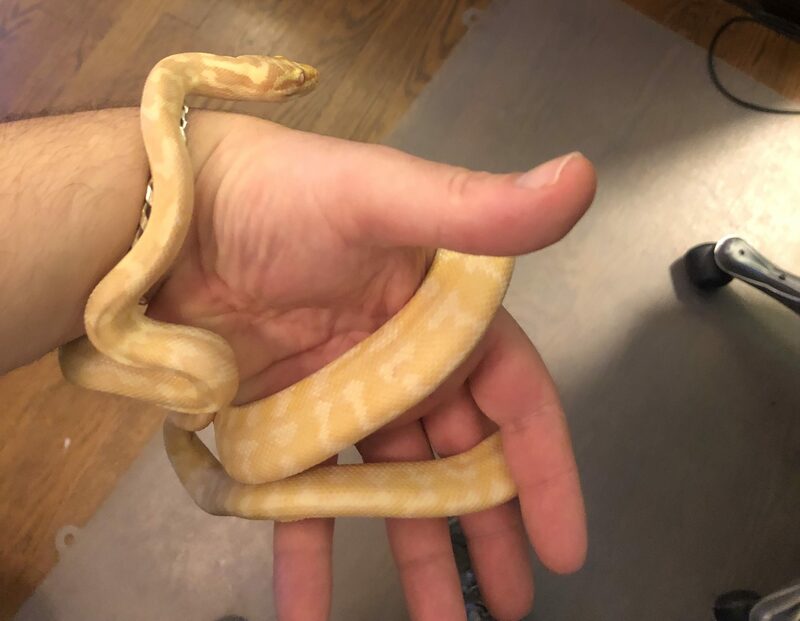 To say I didn't spend much time handling him would be an understatement. What I can say is he was tongue flicks galore. From the moment I went to pick him up through putting him back; flick, flick, flick, flick, etc. That's a good sign. No regression there. I did not spend enough time or hold his head close enough to notice any quiet pops, but there were also no loud/audible popping noises either. Not conclusive, however I wanted to report. Unless anything more "comes out," or I notice something really bad, he's being left alone until Sunday, when I offer food. I'll advise again Sunday night/Monday morning. Thank you again to everyone for joining me and supporting me on this roller coaster. It means the world to me, Katie, and Yafe. Yafe has been tracking me at night the past two nights. Tongue flicks, following me with his head, etc. 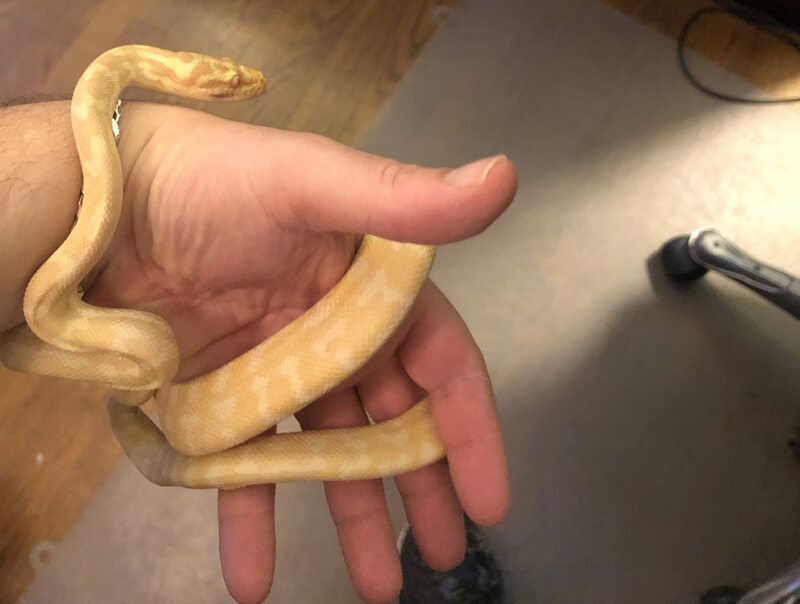 So, literally every other snake is due to be offered food tomorrow night and I expect them to eat (except probably Shayna, BP, who is on winter fast and ate last feeding, but hadn't eaten in the prior 2 months). I decided to offer Yafe tonight. He ate last Saturday, so it's been one week, and his behavior seemed to indicate he was interested. I am also able to give him my full attention tonight. I offered, and he did seem interested. Tongue flicks galore, he tracked it, he poked it, etc. However, no strike. I re-warmed it, offered it again, and the same behavior. I left it for an hour, but he did not eat. I heard no wheezing or popping and he seemed okay, and has been active lately. I have not taken him out, handled him, got close enough to hear him breath, etc. However, he continues to flick his tongue, sleep/rest with his head down, move around the tank from hot spot to cool spot, from hide, to next to hide, to branches, to hot spot on branches, to cool spot on branches, etc. He's a busy and active little guy. I would like to think he's feeling better. He will eat when ready. I am not really sweating it. I will not handle him until he eats again, or unless he shows me something to worry about, or a reason to take him out (to clean his tank etc.). I will offer again in another 5 days or so. I know I've been really worried, but he's showing me enough good signs that I am really not too worried at the moment. Would I have preferred if he ate? Of course! However, I am not by any means freaking out. Again, many positives, and he will eat when ready. I think he's only just beginning to feel hungry & like hunting again...remember, he hardly knows what food is. Bet he eats next time, in a few days. Last edited by Bogertophis; 12-01-2018 at 11:50 PM. If you feel like it, try this next time..
Take the already defrosted rodent and put in hot water for 10 mins. Just hot, not boiling hot. Then drain water and add hot water again. A bit hotter this time, but not burning hand hot. (the smaller the rodent,the shorter the time). 7 minutes or so. Grab the rodent, roll up in some papertowels, take to the cage and only unroll it right before offering. Something about the minutes in hot water truly warms the rodent through and through and I find that some snakes after a long break want a really good heat signature that goes deeper then just what was blasted by the hair dryer. Good point Zina10, but I do that already. . I warm in hot water and dry with paper towels. 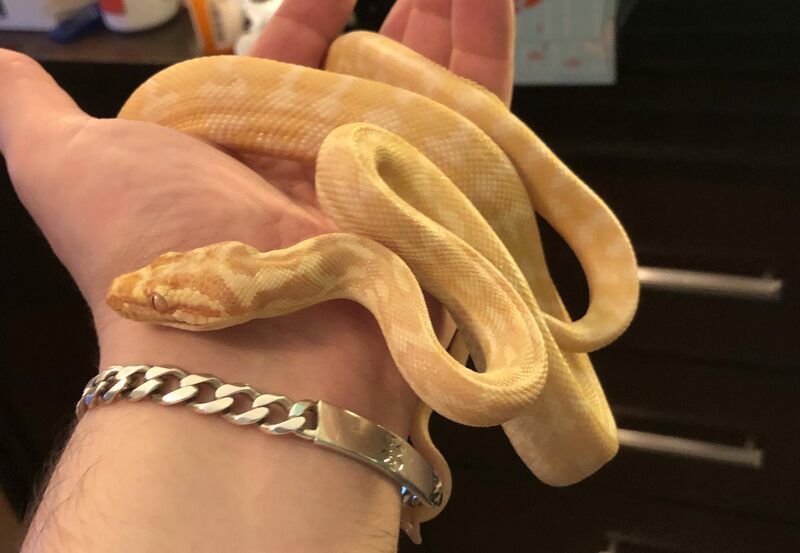 The corns and boas could care less, but I tend to get a better response from Shayna (BP) - better heat signature that way. The mouse was over 100F when I offered; temp gun verified on multiple spots. I find my snakes prefer to the hair dryer method as it warms the entire rodent quicker and uniformly. He was very active again last night and was all over the tank. He will eat when ready. I will offer again in soon, but not too soon. I've got great news, I've got great news, I've got great news! I REPEAT, I have great news! First, I did offer a mouse a couple of days ago, because he was tracking again, but he did not eat. I called the breeder and asked if they can do this in the winter, etc. as I know very little about Carpet's. He said that some of them can get picky and just randomly refuse, but that they generally do not lose much weight, keep offering, and they will get back back to eating normally again. He said they generally don't fast as long or as religiously as BP's, but they can have their moments. I also read on one of EL-Ziggy's threads (shout out brother) that his carpet was picky when young and then grew out of it. Either way, I am not sweating it too much, but I had an idea, and the breeder thought it was worth trying. This weekend I am going to offer a rat fuzzy, about the same weight as the small/weaned mice/large hoppers I have been offering Yafe. Maybe that peaks his interest? Secondly, the really good news. He was due for a water bowl cleaning today, and frankly, I couldn't take the anticipation anymore; I had to pick him, it's been 2 weeks! I have no idea if he's doing better, the same, or worse. I know he has not regressed to the point of mucus out of the nose, etc. and he has been very active, and when he rests/sleeps, he's been doing so with his head down. Well, I took him out for 2 minutes to check on him. He looks, sounds, and acts totally normal. He's calm, his tongue flicks normally and often, he held on to me with a good grip, but without any sudden squeezes or spasm like movements. There were not pops, wheeze, etc. and there was no sign of mucus or nasal discharge at all, new or old. I think the RI is behind us for good! Now, we just have to get the stubborn little dude to eat regularly. Why can't he be a good piggie like Figment, Solana, Behira, and Feliz? I guess he would rather be like his sister Shayna, the BP. Great! Last edited by dakski; 12-07-2018 at 06:54 PM. That is GREAT news D! Sounds like the RI is in your rear view now. Don't even worry about him not eating. He will. My female albino did the same thing for the first few months when I got her. It can't hurt to try a different prey item. All of my carpets eat whatever I offer them. Congrats on the progress and keep up the good work brother. So glad to hear that it sounds like he's completely healed! Fingers crossed he gets his appetite up soon! One thing I'm wondering is if maybe the prey you've been offering is too small for him to be truly interested? I completely understand why you want to start him off slowly, and it makes sense to offer smaller meals that are easier to digest. I'm sure you probably found this in your research on his breeder (both of our carpets are from them) but figured I'd post it just in case. They have a very particular protocol for the prey they offer since they have so many snakes.